Over the last few years, modeling chocolate has come a long way. Back when I started the most common use, of course, was chocolate roses!! And it was fascinating to see how chocolate can be rolled into this beautiful flowers. 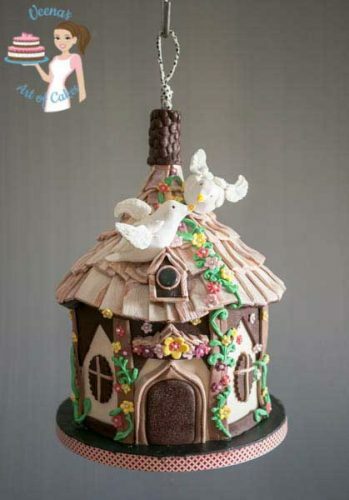 As novelty cakes started becoming a trend so did the use of modeling chocolate. Modeling chocolate especially white modeling chocolate become the most used to fill gaps and mold shapes which were not possible with fondant. In fact these days, cake decorators that enjoy good weather you white modeling chocolate exclusively for modeling figures or faces. 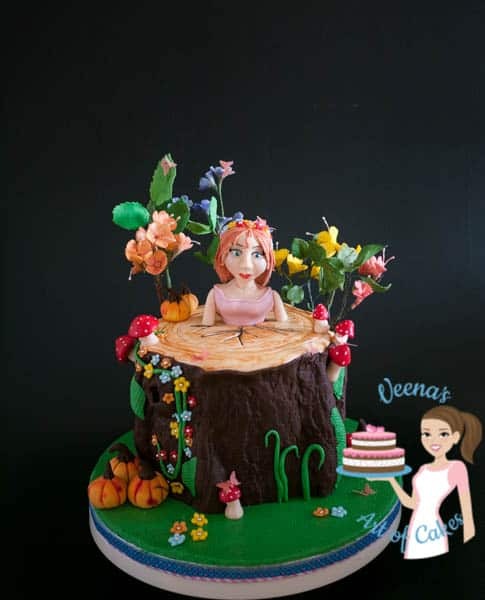 You see the figure on this cake? 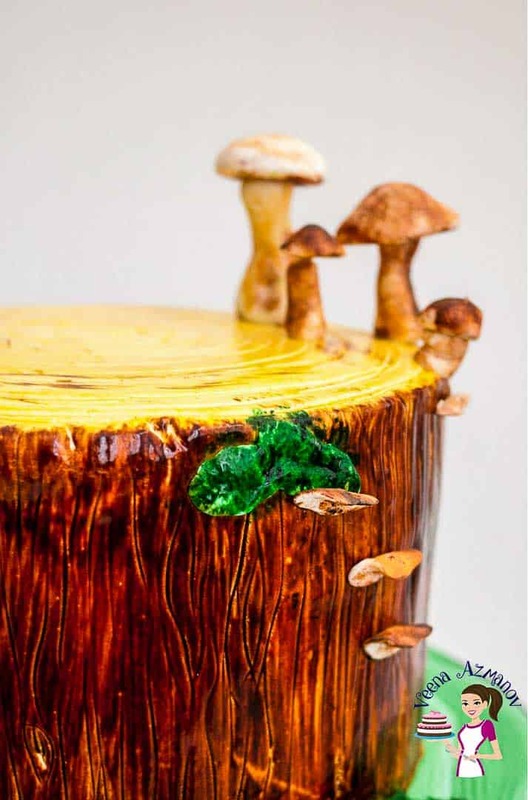 It’s only white modeling chocolate, so is the top of this tree trunk cake. How many times have you tried to make modeling chocolate? especially white modeling chocolate and have it split on you. I’ve had my share of that in the beginning when I just started off. Most often when I’m in a haste; that’s when it would screw up. White chocolate is of course just cocoa butter so caution is your best friend. 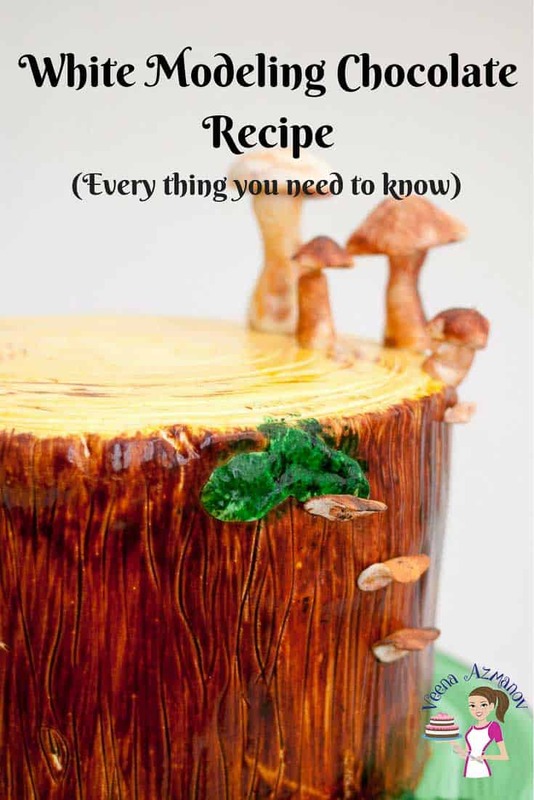 There are many various recipes online and some work, some don’t. Why? I think it’s based on the type of chocolate you use. Today I’m going to share with you this simple and easiest method to make white modeling chocolate without any splitting or curdling. You see the roof on this hand bird cage? Yup, white modeling chocolate. 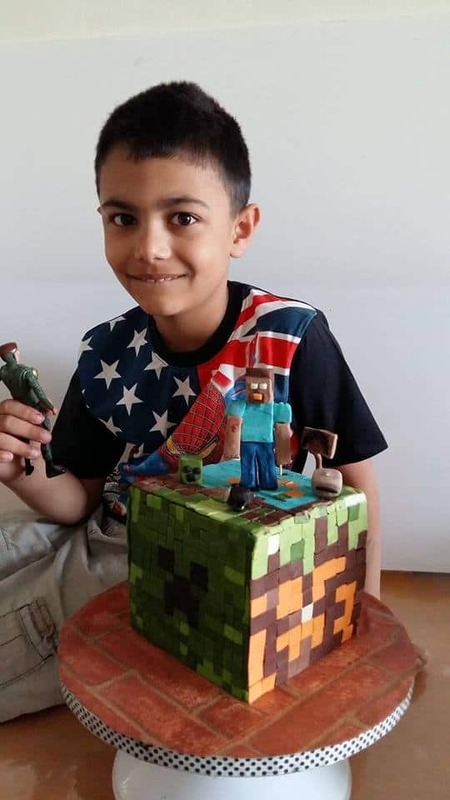 You see these squares that my Aadi put on his Mine-craft cake last year? He made this cake! Those are white modeling chocolate squares I colored. He had fun putting the squares together but also eating them simultaneously. Which makes using modeling chocolate more desirable over fondant. He even made the topper himself using modeling chocolate. Chocolate – I have made this recipe with good quality Callebaut chocolate, candy melts as well as regular supermarket brand chocolate chips. It always works!! Light Corn Syrup – I do know that some of you do not get light corn syrup where you are. A good substitute is glucose syrup – works exactly the same way. Flavoring – you can add any flavor if you prefer – vanilla, rose or even liquor. Melt chocolate in a microwave or double boiler. Once melted add light corn syrup. Stir until just combined (see tips). Pour into a ziplock bag, spread and level it for quick cooling. Leave in the fridge to cool for at least 3 hours or on the counter overnight in good weather. Remove from the fridge a few hours and let come to room temperature. If the paste is very hard – thaw in the microwave for 5 to 10 sec (see tips). Knead until just smooth and pliable (see tips) before you use. Store in the fridge for three months or in the freezer for up to 6 months. 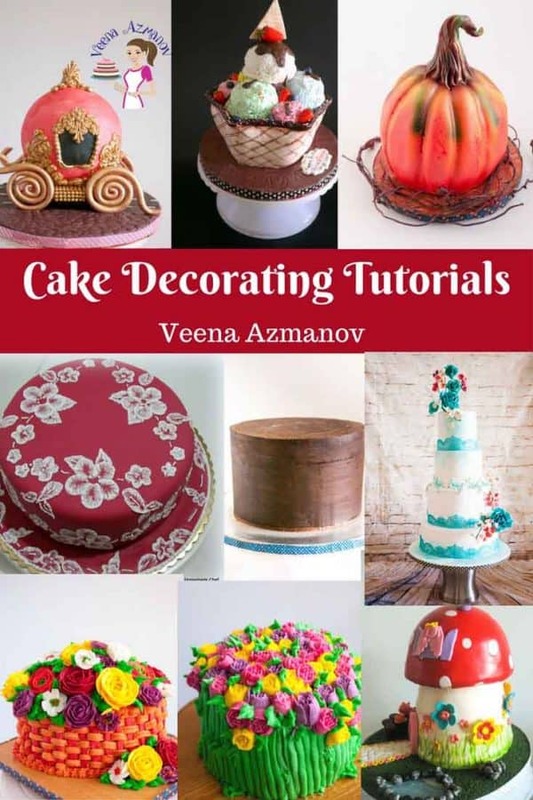 Modeling chocolate has become a basic cake decorating recipe with so many possibilities. 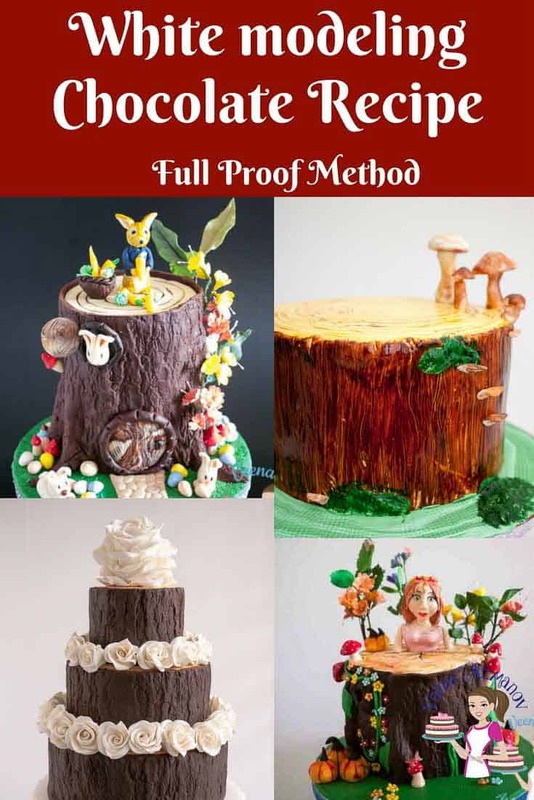 White modeling chocolate can be a bit tricky, but this simple, easy and effortless recipe will give you the perfect ratio for the best modeling paste as well as the right method, tips, and tricks you need to master and use white modeling chocolate paste. Leave in the fridge to cool for at least 3 hours or on the counter ziplock in good weather. I have always wanted to try this but had no idea it was so easy and could be stored for so long – amazing! Hi.i tried this recipe with compound white chocolate.aftr resting wen i kneaded it crumbled.where i m wrong? Divya, continue to knead gently and let me know if it works..!! Sounds like it’s either undermixed or not kneaded enough. Knead gently and let it cool if necessary. Over-kneading can also cause oil to be released from white chocolate quickly. Hello Veena! I am new to your site, but I have to say I LOVE it! You have helped me in so many ways. I am pretty much self taught (through wonderful sites like yours) and bake from home. I have only starting baking for outside of my family this past year. So, I would like to thank you for being so generous in sharing. 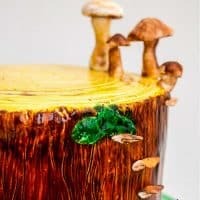 That being said, I have been searching your site on how to color white molding chocolate (love your tutorial by the way)and I seem to be unable to find anything. Do you have a tutorial out for that yet or just a “how to” page? Thanks in advance! ? Natalie!! thank you so much for the lovely comment. So happy to hear that my work is helpful. Appreciate you taking the time to write. I do have a video on how to color modeling chocolate. You can actually use regular gel colors. I use Magic Colors gel colors or Americolor works too. Unlike chocolate, modeling chocolate works with gel colors. I have a video on you tube and perhaps here on my page. Hello Veena, first, thanks for your generosity in teaching us and sharing your recipes and knowledge. Would like to know if is possible to know which brand of chocolate chips do you use to make white or the other types of modeling chocolate ? Also, have you used candy melts disk by Wilton?